January 7, 2019 EFI colloquium: Damiano Caprioli, "On the origin of the cosmic radiation - 70 years later (a tribute for Fermi's pioneering paper of 1949)"
February 1, 2019 PSD colloquium: Pierre-Louis Lions, College de France, "Mean Field Games: What? Why? How?" February 21, 2019 Physics colloquium: Marc Kamionkowski, Johns Hopkins University, "Heretical hypotheses in the hunt for dark matter"
April 9, 2019 Brinson lecture: Sara Seager, "Exoplanets and the Search for Habitable Worlds"
EFI colloquium: Damiano Caprioli, "On the origin of the cosmic radiation - 70 years later (a tribute for Fermi's pioneering paper of 1949)"
A theory of the origin of cosmic radiation is proposed according to which cosmic rays are originated and accelerated primarily at the blast waves of supernova remnants and in relativistic jets of active galactic nuclei. One of the features of the theory is that it yields naturally a power law for the spectral distribution of the cosmic rays and explains in a straightforward way the heavy nuclei observed in the primary radiation. 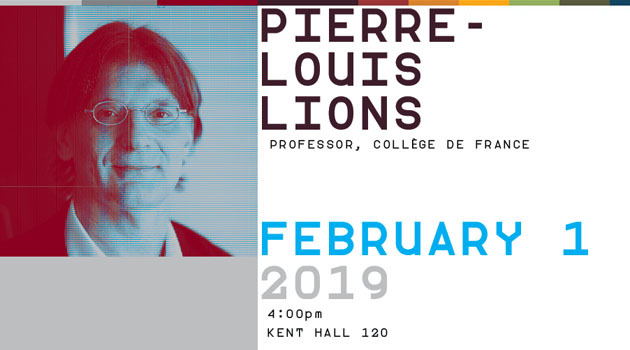 PSD colloquium: Pierre-Louis Lions, College de France, "Mean Field Games: What? Why? How?" Pierre-Louis Lions is one of the most well known mathematicians of our time. He graduated from the Ecole Normale Superieure in 1977, and received his doctorate from the University of Pierre and Marie Curie in 1979. His main work is on the theory of nonlinear partial differential equations. He received the Fields Medal (comparable to a Nobel Prize) for his work in 1994. Lions was the first to give a complete solution to the Boltzmann equation with proof. He has received numerous other awards. Currently, he holds the position of Professor of Partial differential equations and their applications at the prestigious College de France in Paris as well as a position at Ecole Polytechnique. In the paper "Viscosity solutions of Hamilton-Jacobi equations" (1983), written with Michael Crandall, he introduced the notion of viscosity solutions. This has had a great effect on the theory of partial differential equations. More recent work includes the theory of mean-field games, which promises to be highly influential in economics. Pierre-Louis Lions has also been interested for a long time in mathematical finance writing seminal papers on a variety of subjects, such as the use of Malliavin calculus, Monte Carlo methods, applications of stochastic control, and convexity properties. Physics colloquium: Marc Kamionkowski, Johns Hopkins University, "Heretical hypotheses in the hunt for dark matter"
We have known for a reasonable fraction of a century that most of the matter in the Universe is dark, and for several decades that it cannot be baryonic. The nature of this dark matter has, however, been elusive. The prevailing weakly- interacting massive particle (WIMP) hypothesis that have long been theorists preferred guess faces considerable pressure from an array of null searches, and this has led theorists to consider previously unpalatable alternatives. I will discuss the rise, and possible fall, of an idea that connected LIGOs discovery of black-hole binaries to dark matter. I will also discuss recent ideas (motivated in part by an intriguing recent experimental result) that involve particles with enhanced couplings to ordinary matter. 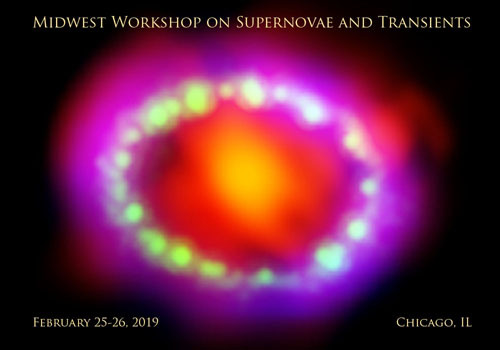 The purpose of the workshop is to bring together the Midwest community interested in supernovae of all types, and Galactic and extragalactic transients in general, including kilonovae, fast radio bursts, TDEs, gamma-ray bursts, novae, X-ray binaries, and anything that varies on a short timescale. We will deal with all aspects of these objects, including the explosion mechanism, progenitors, evolution, nucleosynthesis, and radiation over all wavelengths from radio to gamma-rays. Ample time would be given to students and postdocs, and significant time reserved for discussions. The workshop is organized by the Department of Astronomy and Astrophysics at the University of Chicago. Brinson lecture: Sara Seager, "Exoplanets and the Search for Habitable Worlds"
Sara Seager is an astrophysicist and planetary scientist at MIT. Her science research focuses on theory, computation, and data analysis of exoplanets. 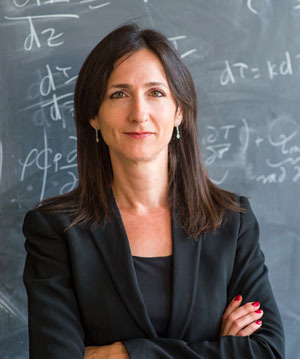 Her research has introduced many new ideas to the field of exoplanet characterization, including work that led to the first detection of an exoplanet atmosphere. She received her Ph.D from Harvard University in 1999. Before joining MIT in 2007, Professor Seager spent four years on the senior research staff at the Carnegie Institution of Washington preceded by three years at the Institute for Advanced Study in Princeton, NJ. Professor Seager is on the advisory board for Planetary Resources. Professor Seager was elected to the National Academy of Sciences in 2015, is a 2013 MacArthur Fellow, the 2012 recipient of the Raymond and Beverly Sackler Prize in the Physical Sciences, and the 2007 recipient of the American Astronomical Society's Helen B. Warner Prize. She has been recognized in the media, most recently in Time Magazine's 25 Most Influential in Space in 2012. 2019 Brinson Lecture: "Exoplanets and the Search for Habitable Worlds"
For thousands of years people have wondered, "Are there planets like Earth?" "Are such planets common?" "Do any have signs of life?" Today astronomers are poised to answer these ancient questions, having recently found thousands of planets that orbit nearby Sun-like stars, called "exoplanets". Professor Sara Seager will share the latest advances in this revolutionary field. This event is co-sponsored by the University of Chicago and the School of the Art Institute of Chicago.